Variable frequency drive control panel (also named VFD panel, AC drive electrical control panel) is consisted of inner VFD inside the cabinet with external control, protect, display and other electrical, it's an frequency conversion device to control three phase AC motor (including fans and pumps) in variable speed to save energy. VFD panels adopt enclosed cabinet structure, generally, the protection class is IP20, IP21, IP30, and some panels may reach IP64, IP65 and even IP66 where the application environments need weatherproof, waterproof. The panels surface are coating spray by suppliers, and easy to install in parallel, the panel top configure bus and wiring the VFD keypad to the panel's door for operating directly. Variable speed drive is a dedicated component of the electrical control panel, the panel's frequency convention and main features are depending on the inner VFD and other components configuration. VFD panels are different according to their different functions and applications, generally, it needs customized manufacture base on specified running environment, like in constant water supply panels (one panel control 1, 2, 3 pumps, etc. ), escalators control panels, central air condition circulating pump panels, and fan's control panels. Why we use VFD Panels? VFD panels are designed with a circuit breaker usually, which are connected to the input line power supply to switch the panel on/off, and provide protection when short circuit or overload occurs in the circuits and variable speed drives. In addition, VFD panels can disconnect power to ensure operator's safety during motor maintenance. A frequency control potentiometer is installed on the VFD panel's door, to transmit command signals to the motor according to operator assigned. VFD panel has mains switching function to ensure the system continues operation in case of the variable frequency drive failed. VFD panel has display and operation panel on the front body, which is connected to the electrical components inside the control cabinet. It can display the panel's operational status visually, and convenient for operator control the motor in actual field operations. 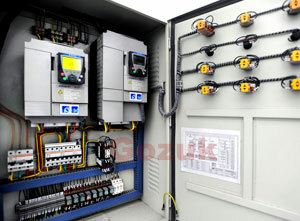 Manufacturers also equip with a variety of instruments and indicators inside the variable frequency drive panels, such as voltmeter, ammeter, frequency meter, and power indicator light, alarm lights, running lights, power frequency lights etc, which will monitor the VFD control panels working status in real time. Include variable frequency drive, all other electrical components are integrated inside the VFD panel, thus reducing the impact of external environment to the electrical components, and ensure the operator safety level like reducing shock hazard rate, so it has a better safety protection function. Typical applications: water supply, air compressors, central air conditioning, port machinery, machine tools, boilers, paper machinery, food machinery and so on.